Amnesty International has released its annual report on the status of capital punishment around the world. Entitled "Amnesty International Global Report: Death Sentences and Executions 2017," you can read it online in its pdf format. Amnesty International has released its annual report on capital punishment around the world. How does the United States fare in comparison to countries like China, Iran, or Saudi Arabia? 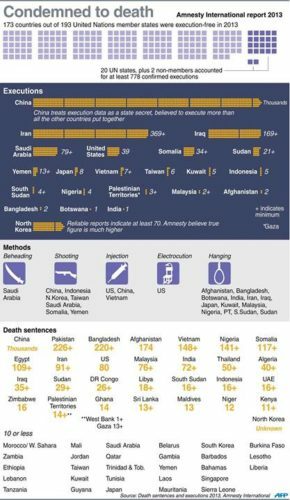 Amnesty International has released its latest study of the death penalty worldwide. A particular concern: China and its continued secret executions. We discussed the China Death Penalty (with the Death Penalty Vans) in a series of earlier posts written by Sin-Ting Mary Liu. More executions are taking place in the world today than they have in the past 25 years. For details, check out this week’s TIME magazine story, reporting on findings released in a recent Amnesty International report. Do You Know About Reprive, the U.K. Organization Fighting the Death Penalty Worldwide? Clive Stafford Smith, the Director of Reprive in Great Britain, has been corresponding with Terry about Pakistan’s death penalty and the case of Shafqat Hussain. October 10, 2014, will be the sixth time that the World Coalition Against the Death Penalty has recognized the international problem of people suffering from mental illness being sentenced to death. Go here to check out the schedule of events.